These classic men's frames come in a range of colors that will help him create a trademark look though his eyewear. 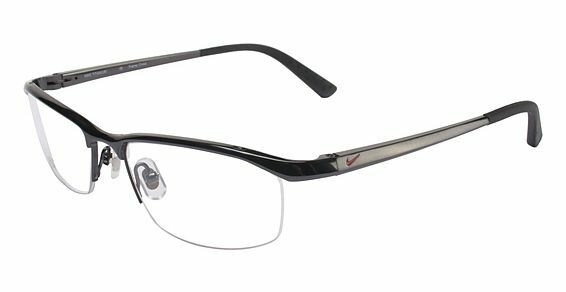 If you're tired of your metal eyeglasses turning an orangey-brown, opt for these high-quality titanium Nike 6037 eyeglasses that are corrosion-resistant and lightweight. Say goodbye to those annoying headaches you get from your heavy metal eyeglasses' frames with these super-light super-strong Nike 6037 frames. Once you go titanium, you'll never go back. Align your eyeglasses perfectly to the center of your face with the help of the frames' adjustable nose pads that add more comfort while remaining inconspicuous. If you're looking to create a more striking professional look, you need these semi-rimless glasses. You'll benefit from having some lens protection while adding that dynamic edge to your finished look. These pillow shaped frames with thick distinct rims are for the more serious person; so if you're the type who likes to get things done and succeed, choose a pair of pillow frames to help you win. The simple rectangular frame will add more clarity and authority to your look. So if you haven't already purchased a pair of pillow frames, you're missing out, because remember this - �professional' isn't a label you can just give yourself, it's something that others give you, so prove it through your choice of eyewear. Cool and sporty in their appearance, all sportspeople need a decent pair of sporty Nike 6037 frames. It doesn't matter if you're cycling in the Tour de France or running a charity event, this eyewear for sportspeople is slick, versatile, and most importantly lightweight, meaning your performance will be enhanced. If you were buying a new suit, you'd expect it to fit perfectly to your body, right? The same goes for your Nike 6037 glasses. A high temple positioning will create more comfort to for those with rounder features. Great design and fit. Having script made now. I purchased a set of Nike 6037 frames. They were on back order but I was amazed how fast they came! The frames fit perfectly the first time I put them on. I would definitely recommend ! Best online experience I've ever had buying frames. Thanks guys!! !